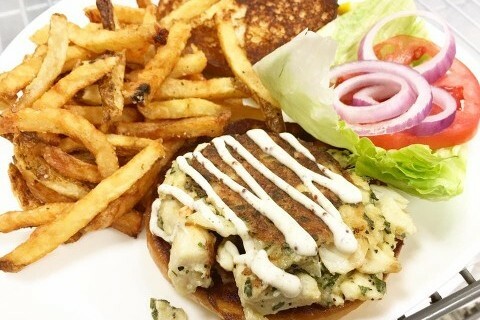 Try Our Award Winning Crab Cakes At Our Family Friendly Restaurant! Drop the anchor and grab a bite to eat at Sauder's Landing. We're a family-friendly restaurant in Jensen Beach, FL, offering casual waterfront dining right in the marina! We feature docks right outside, allowing you to pull your boat right on up to the restaurant and we have dog-friendly patio dining, so you can include the whole family! From steaks and chicken to salads and seafood—you name it, we've got it. Don't forget to try our Award Winning Crab Cakes; even the lovely folks from Maryland have given them their blessing! We run daily specials, so be sure to give us a call to find out what they are for both lunch and dinner. Every kids' meal concludes with a warm Toll House™ cookie for dessert. Our family friendly restaurant features a convenient parking lot, and indoor and outdoor seating. Call ahead seating, walk-ins, take-out and delivery orders are always welcome. Check back with us soon for exclusive t-shirts, hats, and beer mugs. All of our products feature our logo and make great souvenirs. Contact our restaurant in Jensen Beach, Florida, for details on our daily specials.